We are seeing a lot of reports about fake recruiters pretending to offer BPO employees with back office post or non-voice positions. As a call center employee a back office post or a non-voice position is the most sought after position because you don’t have to speak to customers all day. 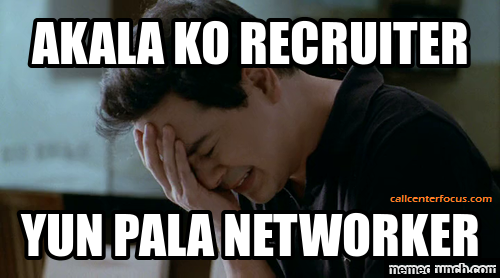 Other victims of these “fake recruiters” often termed the experience as being “Kidnapped” because they were forced to pay a certain amount of money just to get their important documents and if they cannot pay they were advised to pawn their gadgets to produce the amount. To avoid these “fake recruiters” we suggest you join job caravans and open house events so that you are sure that you are dealing directly with the company. Sometimes we do really make mistakes like this because finding a job is difficult. I guess it's okay to laugh at our misfortunes as long as we learn from it. Please share to your friends to raise awareness remember sharing is caring. 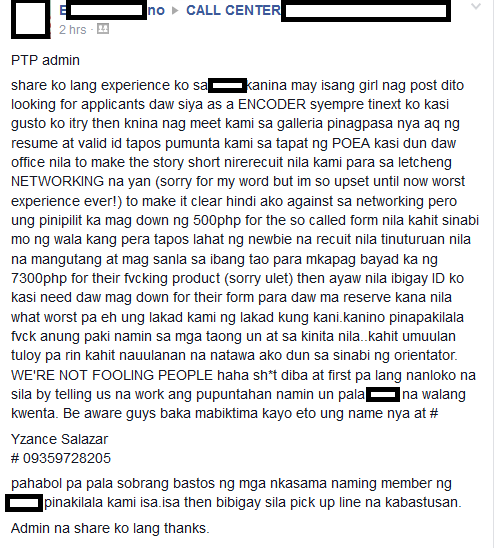 Note: The alleged recruiter might be using someone's identity so it looks like the name"Yzance Salazar" is fake.